Lets say if I had named this starter dish as 'Okra Fry' or 'Okra something' then it would have been just another dish. Not that it has something special, I mean it does but it is the initial interest that makes all the difference. Personally I love okra, other wise known as Vendaikaai [ வெண்டைகாய்] in tamil and Ladies Finger in English. I am sure it is not the favourite vegetable to most and usually it is made into a spicy poriyal or a sweet and sour tamarind based curry. I have seen a few recipes on okra fritters. This is something similar to it but with a filling. The best part is this one recipe can be converted into 3 different starters depending on the availability of the ingredients. 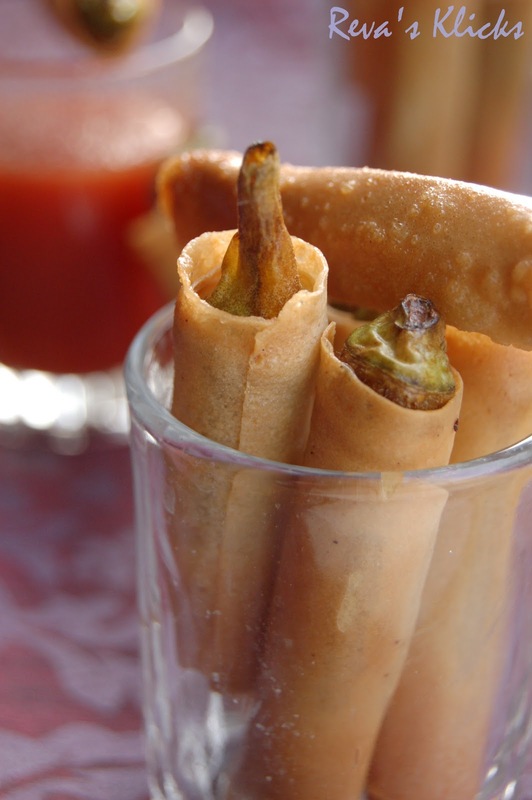 2.If you can't find okra, then cut the filo pastry into squares 5 cms by 5 cms , fill with a teaspoon of the filling and make them into wontons which can be baked in the oven or deep fried. 3.If you can't find okra and filo pastry or don't have the time to do anything, just roast the nuts in a little bit of butter and toss them in some salt and pepper.... Awesome starter with some cocktail/mocktail drinks for the evening entertainment. This filling keeps well for days in the fridge stored in an air tight container and used when needed. The okra for this recipe should be tender and the length of your index finger and less. Only then the finished cigar would be soft and juicy to taste, otherwise you would end up with a hard chewy okra which nobody would relished. This simple starter has three layers of textures : the outer covering is crispy , the second layer is soft and the third layer is spicy and nutty with a welcoming bite. Ground black pepper: to taste. Filo pastry wrapper or samosa wrapper [square ones]: 18-10 sheets. Oil: to fry the cigars. 1.Wash the okra on fresh water and wipe them dry with a paper towel. 2.Pulse the cashews and peanuts together 2 to 3 times just to break them down. Do not grind them as it would become very sticky and paste like because of the oil content in them. 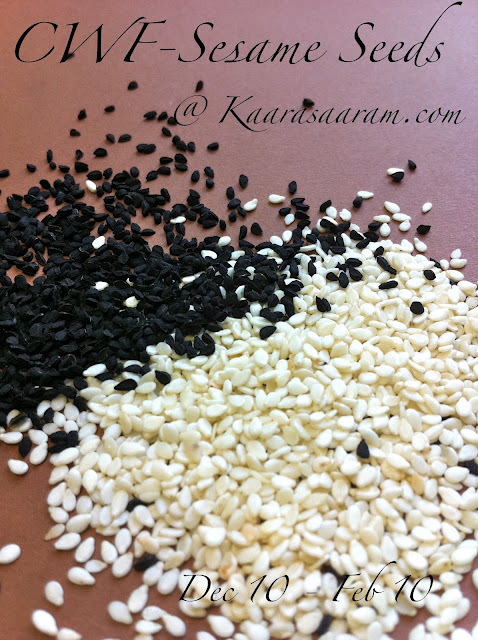 3.Heat oil in a pan and splutter the sesame seeds. Add the pulsed nuts, salt and pepper. 4.Roast in low flame until the nuts are mild reddish brown in colour and a wonderful aroma emanates. 5.Remove from flame and cool. 1.Make a cut on one side of the okra. Be careful not to cut through the ladies finger. 2.Make some space in the vegetable with your finger and stuff the powdered spiced nuts into it. Don't stuff too much and break open the okra, just enough to fill the vegetable. This should be done carefully and with patience. 4.Heat the oil and fry the cigars 3-4 at a time until golden brown on all sides. Serve with some ketchup for a lovely treat. 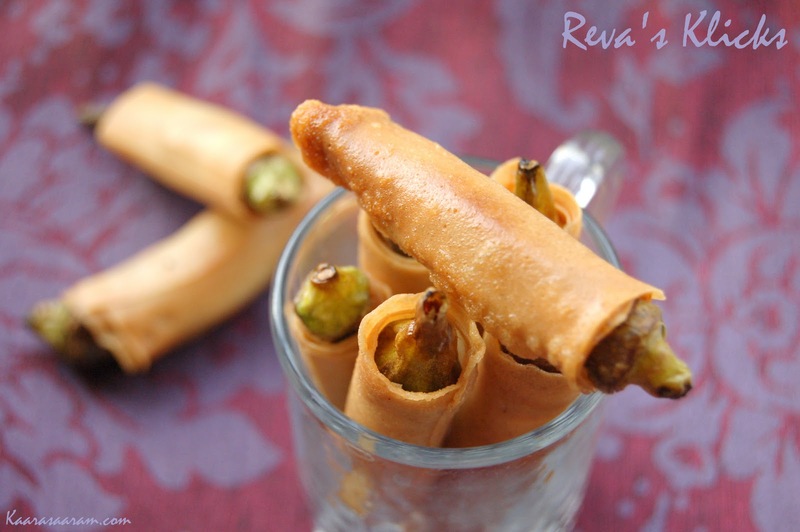 1.Filo pastry: If you are using rectangular sheets which are around 12 cms by 15 cms in size, you need to cut the filo pastry into strips depending upon the length of the okra. There is no need to cut exactly the same length of the okra, an approximate size would do. So it is essential to select the okra of the same length. Ready made filo pastry which are cut into rectangular strips [5 cms by 12 cms] are available in the market which makes the job much easier. 3.Wrapping the okra: Don't over-wrap the okra which would result in an uncooked vegetable which is not liked by many. Also over-wrapping leads to over-frying the vegetable which leads to the okra soaking more oil and resulting in an oily sludgy dish. Just wrapping the okra twice in more than enough. The wrap gets fried in seconds which gives enough time to just cook the okra to a soft bite. 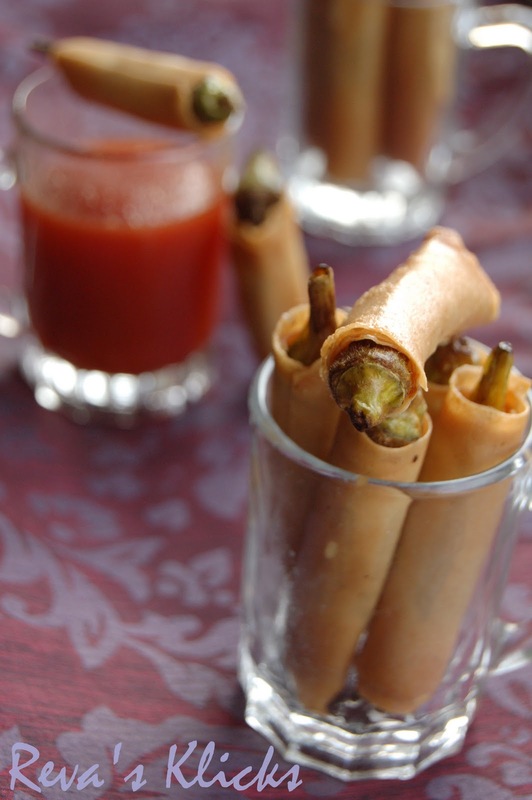 Omg, those okra cigars looks super crispy and irresistible. Looks awesome, love the filling and crispy outer layer. very unique and tempting cigars !! loved them !! Perfect cigars n tempting clicks.. Simply brilliant looking okra cigars. Excellent preparation. Sorry if this question is too basic - but the pastry sheets I got would fry in jiffy. Would okra cook within that time? revs, this is super duper snack...very interesting...looks gorgeous dear! Reva, You rock. I love Okra and this is the best recipe I have seen so far I guess. love the stuffing part very much and just imagine serving okra as a starter and the guests doing a double take. Priceless. 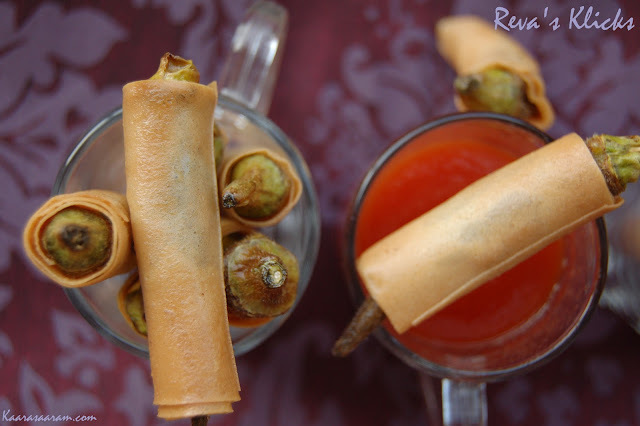 Very innovative recipe.. love the color of the cigars..
sure the interesting name tempted me to peek in here :)..wonderful idea Reva..kudos to u..the cigars are just fabulous.. The okra wouldn't be cooked thoroughly but it obviously not have the raw taste...!!! wow, these okras wrapped in filo looks too irresistable, but I liked the idea of slightly roasting them in pan before wrapping them in filo. This looks so good, nice and delicious. What an interesting dish. You make okra sound so delicious. I've had limited and not very pleasant experiences with okra, your recipe make me want to give it a go again. Very creative. Nice and crunchy recipe....YUM! Perfect picture. they look superb!....love the idea totally....a good appetizer! wow! looks crispy and yummy.new idea. Brilliant recipe! Sounds awesome, very innovative and unique way to make oakra! now thats the height of creativity.....Cheers for turning the plain,boring okras into such an interesting dish!And thanks for stopping by my space too! Awesome...such an appealing idea..and yes the name does make a difference! 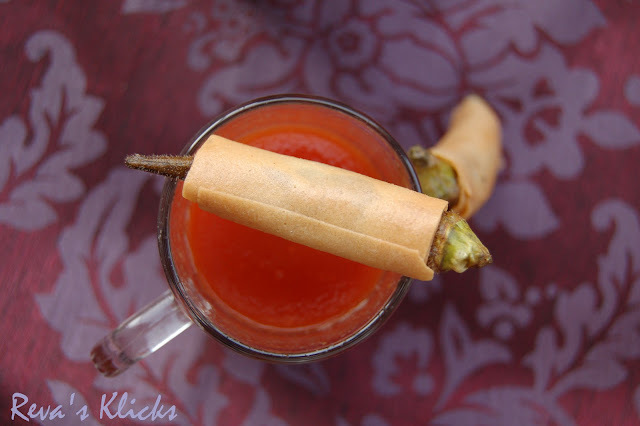 okra cigar looks delicious and perfect snack. 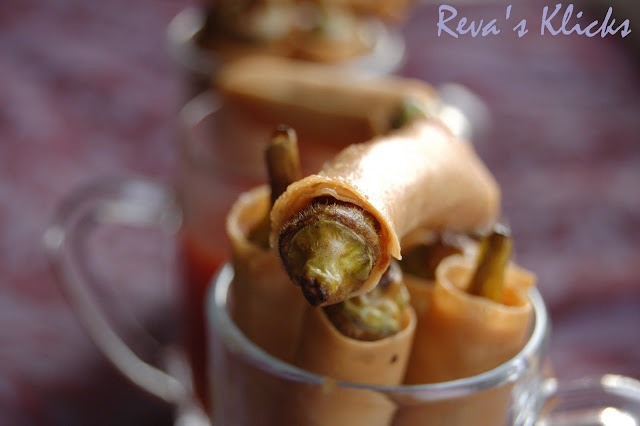 wow am impressed dear Reva...awesome and we too luv okra...will bookmark it to try! Very first time I have seen this dish - seriously!!! Looks absolutely inviting and so creative - love it Reva!!! Awesome recipe and a great Idea to serve stuffed Okra using Puff Pastry Sheets. 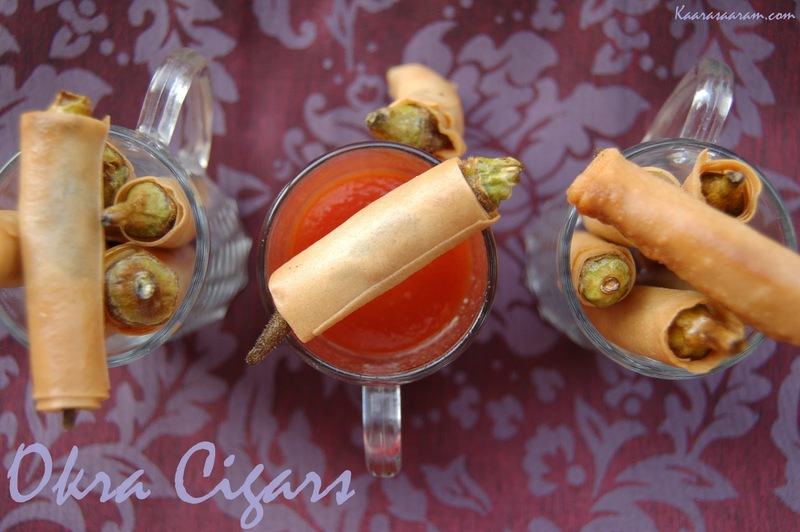 Yumm n innovative Okra Cigars!. Luv it!.